What if Candies had Religion? Would you mind to pick the candy of any other religion? ‘Broken Cameras Films’ had recently conducted a social experiment on this. These guys have used candies to ask the people about their opinion on Religious discrimination. What the participants have answered for the above question will really amaze you. 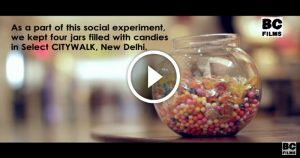 In these times of religious intolerance, this social experiment comes as a delightful watch. Religion unites people. But what we often forget is, that no religion is worth ruining peace and harmony. We are just like these Candies. We are all same but divided into different jars. Stop discriminating people on the basis of religion. We might actually have a peaceful world some day! People in this video echoed that no matter what religion we may be born in, we’re not separated from each other. Humanity is above all religions and that’s a message that needs to go out to every Indian out there.